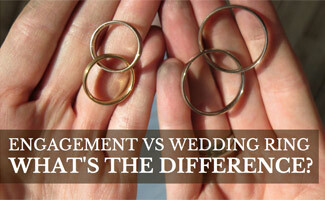 Home > Love > Engagement > Engagement Ring vs Wedding Ring: What’s the Difference? Okay, so almost any woman may consider this article common knowledge but we’re guessing there are a few hopeful fiancés and future grooms out there who may need a little brushing up in the ring department. After all, the rings are a big deal for your bride-to-be and a major purchase on your part. It’s important to know the difference before you begin your search. Here, we’ll tell you everything you need to know about engagement rings vs wedding rings. An engagement ring is presented to a woman upon a proposal of marriage. Traditional engagement rings have a gold, platinum or silver band with a center diamond. You can also find engagement rings with a center diamond surrounded by smaller gemstones or small gemstones set into the band (called pave gemstones). Your choices vary from simple to extravagant, and pricing varies widely. A general rule of thumb is to plan on spending two or three months’ salary on an engagement ring. What is your girlfriend’s ring size? This can be tricky if you’re going for the total surprise proposal. Your best bet is to ask her mother, sister, roommate or friends to do some sleuthing for you. Or you can take one of her rings she doesn’t always wear to a jeweler to have it sized (but make sure it’s the finger she wears on the correct finger as sizes vary vastly). Engagement and wedding rings are worn on the third finger, next to the pinky (called the ring finger, for obvious reasons). What hand does the engagement ring go on? Her left hand. Drill this into your memory so your nerves don’t get the best of you when you’re slipping the engagement ring on her finger! In most Western countries, men do not wear engagement rings, only wedding bands. Some online or in-store jewelers sell male engagement rings, but the overwhelming majority of men in the U.S. don’t wear one. There are some cultures around the world where both men and women wear engagement, or commitment, rings. Men and women exchange wedding rings, often called wedding bands, during their wedding ceremony. Wedding rings aren’t as intricate as engagement rings. Men typically have a simple gold or platinum wedding band, and women often either choose the same kind of wedding ring as their groom or a band with paved diamonds (or other gemstones). Both bride and groom place their wedding rings on each other’s left ring finger. For women, the wedding band is traditionally worn at the base of your ring finger with the engagement ring stacked on top. Should You Consider Engagement and Wedding Ring Sets? Many people opt to purchase matching engagement and wedding ring sets for several reasons. First, you know the rings will match in appearance once worn together (the wedding ring sits below the engagement ring, so it’s closer to your heart). Also, a matching set will reduce the risk of mismatched rings pinching your skin if they don’t fit next to each other well. You also may be able to save a little money by purchasing a set. Need Some Wedding Proposal Do’s and Don’ts? Check out this video from wedding site, The Knot, for some tips that may come in handy. So, now you know the difference between engagement and wedding rings, and you’ve got some initial tips on when to buy and how to propose. Keep your budget in mind while shopping around — it’s easy to get carried away for the one you love. And make sure you see our article, Best Online Engagement Rings, for some recommendations on where to buy engagement rings online. Have any tips on buying engagement rings and/or wedding rings?